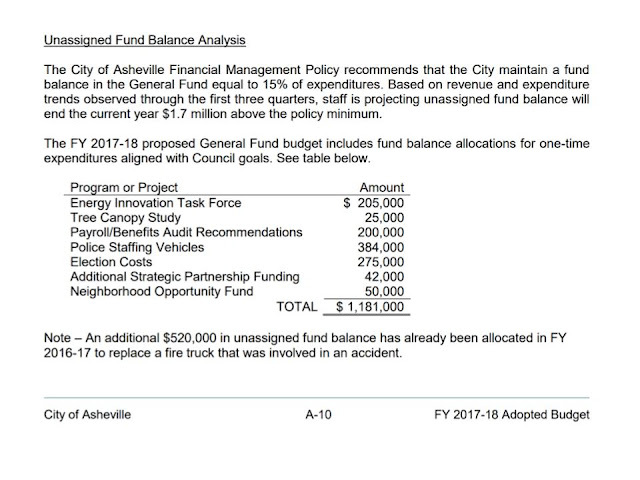 At its July 25 meeting, Asheville City Council voted unanimously to dip into the city’s “rainy day” fund to cover a $441,000 overage to the $850,000 transit allocation it had just approved, as part of the new city budget, on June 13. The budget overrun is being caused by overlapping monthly payments that will occur as the city phases out its existing contract with Transportation Services of America, its present bus service provider, and phases in a new agreement with McDonald Transportation Associates. But whereas the RADTIP miscalculation, huge as it was, involved only future numbers on a spreadsheet and the cutting back of huge portions of the RADTIP plans, the additional transit funding is cold cash that must be plugged into a very real budget hole to pay for very real services. Law requires the city to keep and maintain a percentage of its annual budget as a hedge against emergencies. In Asheville’s case the state-mandated amount would be 8% of total budget, but the city’s own ordinance sets the bar higher, at 15%. That amounts to $18 million at present. Nevertheless, observers say, “slightly below” is still below and indicates that perhaps, the City has exhausted its other funding capabilities. But what about the budget excess? Once again, as on June 27, it fell to Assistant City Manager, Cathy Ball to bear the message and take the heat, even though her boss, City Manager Gary Jackson, who was absent last time around, was sitting in his accustomed seat on the council dais. Standing at the same lectern where she delivered the news about the $26 million, Ball delivered a power point presentation that outlined the city’s decision to hire McDonald, highlighting the additional and better services the city would be getting through a turnkey plan as opposed to the current fee-based arrangement. She related the turnkey approach was approved by the city’s finance committee last September and mentioned the constraints the city had to work under to insure receipt of Federal Transportation Authority funds. So Ball returned to the podium. Ball: “We were not allowed by FTA to make that a consideration.” She returned to her seat. Ball trudged back to the lectern. “We typically would not bring a specific contract to council,” she said. “We generally just present you with a resolution asking the city manager to execute it.” Ball said this case was different because it happened that “We did have a contract [to satisfy FTA] already prepared, so you got to see that. “So it’s not that we weren’t trying to be transparent,” she said. To followers of council procedure, Haynes’ question begged another. Up until the morning of the council meeting the motion to allocate the $441,000 to pay for the transit overage had been tucked away deep inside the meeting’s consent agenda, a list of routine business items, submitted by the city manager, that are usually dealt with en masse by a single approval vote. But that item was missing from the agenda that was circulated just before the meeting. Instead, Mayor Esther Manheimer noted that the funding motion had been broken out separately and would be discussed in open session, complete with an opportunity for public discussion. Whatever the case, council member Julie Mayfield moved to approve the budget amendment and was promptly seconded by councilor Cecil Bothwell. The mayor then opened the floor to public discussion. Council then voted unanimously to approve the measure. “I hope this is going to get us to a better place,” said Mayfield. The question was dealt with in just under 25 minutes. On February 21, incumbent Asheville mayor Esther Manheimer announced plans to run for a second term this November. And for a while there seemed to be a real possibility that she would walk right into it. She simply had no opponents. Candidate-wise, the local Republican Party was missing in action. No unaffiliated or third-party candidates came forward. Within the Democratic Party establishment, Manheimer was up to her signature slimline spectacles in endorsements and connections. And she was clad in the armor of four years as mayor and four previous years as a city councilor, including two as vice mayor. Manheimer is considered both smart and ambitious (She does, after all, work as a land use/foreclosure lawyer for the prestigious Van Winkle law firm and she was just re-elected chair of the North Carolina Metropolitan Mayors Coalition.) She’s been credited with saving Asheville’s water system from a state takeover, staving off (so far) state-mandated voting districts, and selling city taxpayers on $74 million worth of general obligation bonds. To many she’s the poster child of Asheville yuppie progressivism. Shortly after she was elected mayor in 2013, Manheimer was depicted as a ship’s figurehead in a local cartoon. That’s how she has been described by both further-left members of her own party, who consider her a PINO (Progressive in Name Only), and by city government critics who say she serves as rubber-stamp-in-chief for city manager Gary Jackson. And her copybook has some blots: Maheimer acquiesced in both the city’s seizure of Pack Place and the Art Museum’s attempt to sell naming rights to parts of Pack Square. Both the ongoing bond lawsuit and the $26 million RADTIP overrun boondoggle have taken place on her watch and she just voted to tap into the city’s “rainy day fund” to the tune of $441,000 for a new transit contract and was a staunch supporter of rezoning the River Arts District with form based code - something many property owners personally opposed in the July 25th City Council meeting. A few weeks ago she may have been poised to coast into a second term without having to defend her record, but that’s no longer the case. Suddenly there are three other candidates in the race for mayor. That forces an October 10 primary to eliminate two of the four. Of those at least one candidate appears fully capable of going the distance (see below). The mayor now has a fight on her hands. Jonathan Wainscott announced his intention to run against Manheimer in early June, causing a fair amount of eye-rolling and cries of “Siddown!” from the local political establishment. Wainscott ran for city council in 2013 as a sort of anti-New Belgium populist and became a neighborhood spokesperson for those adversely affected by the brewery’s construction. He proved to be an eloquent and highly informed candidate but many felt he undermined his own campaign through a combination of intemperate utterances and personal problems. Following his announcement Wainscott appeared at a city council meeting, clean-cut and blue-blazered, to deliver a dead-serious and highly articulate commentary on the city’s $26 million RADTIP shortfall. The consensus, though, is that he’s a talented gadfly but lacks the experience and the gravitas to be a mayor. For now, anyway. Another mayoral hopeful is Martin Ramsey, who ran for mayor in 2013, finishing a distant third in the primary behind Manheimer and former city risk manager John Miall. It was, in fact, Ramsey’s last minute filing in 2013 that forced a primary, just as it did this year. This year he’s back with the same message. “Our city deserves a frank discussion of the very real issues facing us and not a victory lap … I’m not afraid to fight and lose, but I’ll fight instead of giving up beforehand. I hope that you will hear, engage, and stand up. I’m an independent and a socialist and I’m running,” Ramsey said. Ramsey appears to have no campaign machinery in place beyond posts on social media and seasoned politicos point out that conversations about issues do not equal fixing issues, and debates alone don’t win elections. The real potential game-changer occurred just hours before the filing deadline, when Jonathan Glover threw his hat in the ring. Glover, 42, may be a political newbie but he’s a local civic heavyweight. He’s a past chairman of the Housing Authority of the City of Asheville and a former member of the city’s Board of Adjustments. He’s been a member of the executive board of Asheville-Buncombe Vision and a past chairman of the Diversity Advisory Council of Carolina Day School (of which he’s a graduate). He’s a volunteer with Caring for Children and a past board member of the North Carolina Arboretum. And he just ended a 20-year stint as an intercollegiate soccer official. A graduate of Catawba College, he spent four years as a financial advisor with Merrill Lynch and a year at Morgan Stanley. 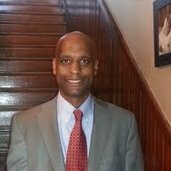 Presently he’s a mortgage loan advisor with Mortgage Planning Group and is also a software consultant with Toshiba Business Solutions. Party-wise, Glover is unaffiliated. He considers himself fiscally responsible. [Asheville is] is a mess,” he says, “But it’s not an impossible mess. We need to reprioritize some things. I care a lot about those who have been left behind and I want all Asheville citizens to succeed and will work hard toward those goals. Especially,” Glover says, “we need to create new jobs. Not service industry jobs, but sustainable jobs. Jobs that can support people. We need to look out for the people who live here. Charity begins at home. “I learned so much of this from being around Watt Daddy [legendary black community leader and city councilman Herb “Watt Daddy” Watts] growing up,” Glover says. “He was like a second father to me. “It sounds like a small thing, but I’d also like to see us lose the term ‘affordable housing.’ People are reluctant to sign up for it because it leads to labelling; it carries a stigma. And it puts developers off. Let’s not just create community housing, let’s think of something more positive to call it,” Glover says. The Whole Election: Is For-Real Diversity Here to Stay? Bothwell, through sheer crankiness and unpredictability, has become something of an institution; Wisler has emerged as Manheimer’s wingman and, in some cases, as council’s conscience. Both have the weight of their incumbency behind them. But the unexpectedly large field of challengers includes four ethnic minority candidates and a total of six women, making it possibly the most diverse slate in Asheville history. For voters whose principal aim is seeking to change the dominant face of city council, the announced candidates offer clear possibilities. They include political newcomer and Green Opportunities staffer Sheneika Smith, Green Party candidate Dee Williams, hotelier Pratik Bhakta, realtor Jeremy Goldstein, economic consultant Vijay Kapoor, Beaucatcher neighborhood activist Jan Howard Kubiniek, financial advisor Rich Lee, public transit advocate Kim Roney, accountant Adrian Vassallo, and musician Andrew Fletcher. Politics is a field where possibility and reality vie for dominance on any given day. There is a possibility that the 2017 election could see a controlling majority of four minority newcomers swept into office. The reality is that won’t be easy. But the very fact that such diversity is emerging in a city government election in Asheville, North Carolina, is being seen by local observers as an indicator of a fundamental shift in public thinking. Buried deep in the City Council meeting agenda for July 25, 2017 is the approval of McDonald Transit contract for the operations and maintenance of the Asheville City Transit System. A memo from Assistant City Manager, Cathy Ball, requests additional funding of $441,000 that will need to come from the rainy day fund in order to fulfill the transit contract. So, not only does our Transit system lose $7 million a year but now, the City will have to start using its rainy day fund to pay for ongoing operations and maintenance. North Carolina municipalities are required to maintain 8% of General Fund expenditures, often referred to as the "rainy day fund" to be used in an emergency. Our City maintains 15% to be safe but that is only $18 million. Considering that the City recently experienced a $26 million budget overrun causing a massive scale back in its RADTIP project, it is easy to see how that amount can easily be eaten up in one project. $18 million is not much to put aside for a City with $65 million in debt. Another recession or major event such as a flood or fire could deplete those funds easily. City Council members and candidates for the 2017 election should take note of this. Since Council was "blindsided" by the recent $26 million budget overrun of RADTIP by City Staff, let's hope the Council is aware of this beginning leak of its rainy day fund. That loud scraping noise you may have heard downtown last Tuesday was the City of Asheville’s flagship development project running aground on the shoals of a massive -- and apparently totally unexpected – construction cost overrun projection. The $26 million underestimate is already being called the biggest city financial boondoggle in recent memory. It sent council scurrying to approve a budget addition of $6 million so that it could save a $14.6 million federal grant that is the linchpin of its treasured River Arts District Transportation Improvement Project (RADTIP). And nobody seems to know how it happened. The city manager’s office received bids for the RADTIP construction in May. Council passed the new city budget at its meeting on June 13. Neither during that interim nor at the council meeting was mention made of any financial wild card that could have affected the RADTIP work’s previous $50 million price tag so dramatically. The new reckoning puts anticipated costs at $76 million -- an increase of 52% over that figure -- of which the city (and its taxpayers) would be responsible for another $26 million. Which it doesn’t have. 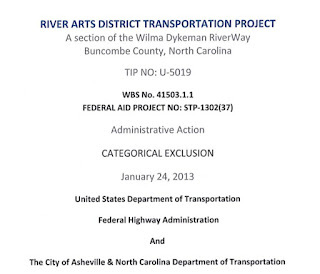 Records show that on June 15, just two days after the budget was adopted, Deputy City Manager Cathy Ball assured the Buncombe County Tourist Development Authority, which has chipped in $1.8 million in hotel tax money towards the RADTIP project, that the city fully intends to go forward with development of the east bank of the 2.2 mile French Broad Riverfront greenway, plus a botanical garden, a “community plaza” and a boat ramp. But those are only part of the suite of projects that made up RADTIP. So, given that the bids were received in May, was the city manager’s office already aware of the projected overage at the time the budget was passed? That much is still unclear (see “The $26 Million Disconnect,” below) What was made clear at the June 27 meeting was that council needed to contribute another $6 million, and it needed to do it then and there because shovels needed to start turning on the river no later than August 1. Or else the TIGER VI money would … well … go away. “I need something I can sign tonight,” Ball told council. TIGER (Transportation Investment Generating Economic Recovery) is a federal discretionary grant program that was founded in 2009 to provide supplementary funding for “surface transportation projects.” The Roman numeral suffix denotes the year following 2009 that the grant is awarded; hence, when Asheville received $850,000 worth of TIGER funds in 2010, the grant was titled “TIGER II.” That grant became the seed money for RADTIP. TIGER VI grants, therefore, were awarded during 2014; in September of that year one of them ended up on the City of Asheville’s doorstep. There was general rejoicing at City Hall. An entire city department was created to implement RADTIP. Even as the original $50 million price tag emerged in 2015, the city was supremely confident. 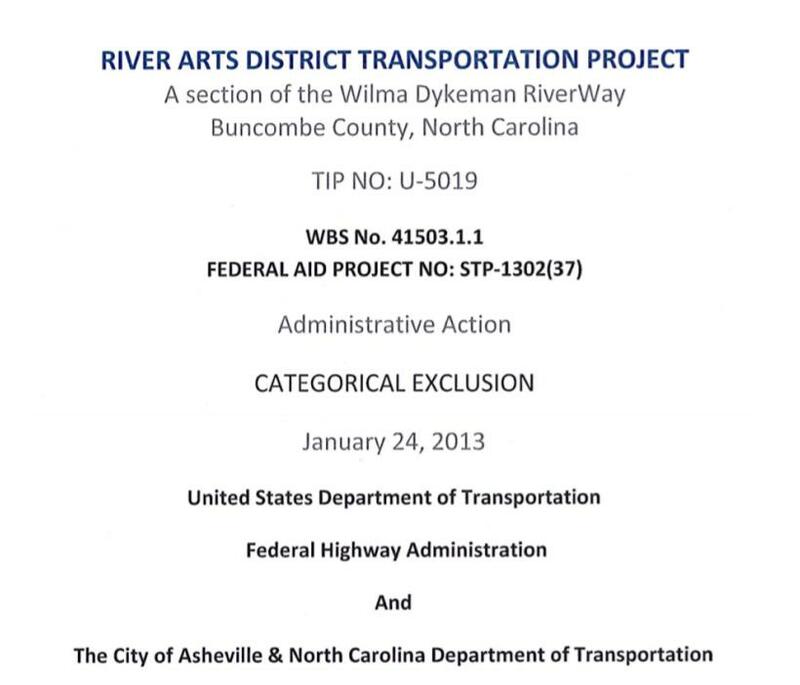 It could count on a $1.3 million public works assistance grant from the U.S. Economic Development Administration; a $4.2 million grant from the state DOT / French Broad River Metropolitan Planning; $1.1 million in other state grants; $1.8 million from TDA; a $300,000 direct contribution from Buncombe County; and $800,000 in retained TIGER II funds. That same year (2015) the city let its bids. The clock ticked quietly away on the TIGER VI’s August 1, 2017, must-start deadline. It is not known whether, over the next two years, anyone was keeping an eye on increases in area construction costs, but subsequent events suggest not. Which is how it came to pass that on the evening of June 27 Cathy Ball took Gary Jackson’s accustomed seat on the dais (Jackson wasn’t in the house) to report that the city needed more money. And to say how much of the original RADTIP plan would have to be jettisoned to keep the ship afloat. The bottom line, Ball said, was that several items would need to be gutted from (she said “delayed”) the RADTIP suite of projects: namely, development of the French Broad Greenway’s west bank as well as all plans for creating the proposed Town Branch and Bacoate (formerly Clingman Forest) greenways. The work she had outlined to TDA on June 15 could go forward, Ball said, plus two traffic roundabouts, road realignment on Riverside Drive and 1.5 miles of new sidewalk, mostly on Lyman Street – provided the city could promise another $6 million. Immediately. The discussion that followed, observers said, dramatically illustrated what has been called “the ongoing disconnect” between the city manager’s office and city council. Vice Mayor Gwen Wisler congratulated staff on its “thoroughness,” but said she had “concerns about transparency and equity” in the bid reviewing process. She called Jackson’s office’s work “stellar up to a point,’ but, she said, “When the bids came in it felt like radio silence. “We can’t guarantee TIGER VI funding without approval tonight,” Ball repeated. The contract is contingent on our being able to turn dirt on August 1. “Do you want me to go ahead and answer the other questions and concerns?” Ball asked. Wisler nodded encouragingly. “The next phases will be very transparent,” Ball promised. “We will have a process to ask our community what they want to see funded, approved, and we will be very deliberate in how we do that. “Transparency will be through a community dashboard so that people will be able to see how much money we have in planning and how much money we’ve spent,” Ball said. No bids for Livingston, but they’ll get a dandy stop sign. A major factor in the time scramble, Ball said, was that initially the city failed to garner the requisite three responses per project after bids were let in May. Law requires that in such cases, any bids received must be returned to the bidders unopened; then projects may be rebid and any and all bids may be opened and entertained. The rebidding process, which council was likewise unaware of, ate up more time, she said. Ball then disclosed that no bids at all were received for pedestrian traffic improvements to the Livingston Street neighborhood, which had been part and parcel of the Bacoate Greenway plans. But city transportation manager Ken Putnam told council Livingston Street will nonetheless get a crosswalk in front of Green’s Grocery, as well as a newfangled stop sign complete with flashing lights. Wisler returned to the time-lapse issue. “What I’ve gotten from the community is the timing on the contracts,” she said. “Talk to me about the 60 days” the bids were said to be good for. “Contractors will only guarantee bids for a certain period of time,” Ball said. “That’s why the city manager wanted to make sure that there was something I could sign tonight,” she repeated. Again. “We brought on board a construction-manage-of-risk consultant in November to do preliminary estimates,” Ball said. A construction manager at risk is a project delivery method in which the construction manager agrees to bring the project in at or under a guaranteed maximum price. “There is a lack of competition in WNC for this kind of work, which drives up prices,” Ball told Council. Her assessment was echoed by other city staffers, who also opined that contractors are reluctant to bid on work that is not scheduled to begin for two years or more, and said this was probably particularly true in the case of the Livingston Street work. The mayor is shocked. Shocked! “I did not fully understand that we did not receive any bids at all for the Livingston Street project; that certainly is a challenge in terms of deciding what to do tonight,” she said. Several members of the group Asheville on Bikes urged council to direct as much funding as possible toward bike lanes and other bike safety measures, stressing that bicycling is a form of multimodal transportation and not a sport or hobby. Former councilman and avid cyclist Marc Hunt asked council to consider widening Lyman Street to include a six-foot-wide bike lane. He came equipped with cross-sectional drawings, which seemed to indicate an advance awareness that RADTIP cuts might be in the offing. In the end the revamped RADTIP package, with its additional $6 million price tag, passed council unanimously. Hunt got his six-foot bike path. And the question of how the bid costs actually managed to increase by $26 million in two years’ time was never resolved. “Time flies when you’re having funds,” Bothwell told Asheville Unreported.